Concrete is a kind of man-made stone. It’s cheaper and easier to get than natural stone, and it’s easier to shape it. You make it by mixing lime and clay and sand and gravel and water. Lime is basically the ashes of limestone; it’s what you get when you burn limestone or marble. Lime and clay and water mixed make cement, and then you mix the cement with sand and gravel to make concrete. 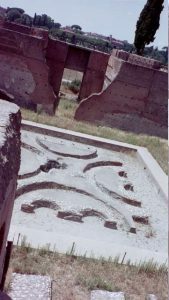 The history of concrete goes back a long time; the earliest use we know about was to make a hard floor for a house in eastern Europe (modern Serbia) about 5600 BC. The Egyptians, Mesopotamians, Chinese, and Greeks knew how to make concrete but they didn’t use it very much. The Romans were the first to use a lot of concrete. 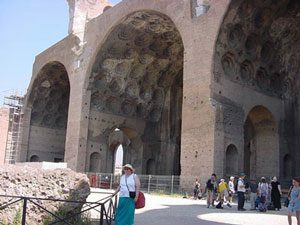 Roman architects started to use a lot of concrete in their buildings about the time of the Emperor Nero, 60 AD, and they used it more and more from then on, usually with a brick facing to cover it and make it look prettier. Concrete made the dome of the Pantheon possible, and later the dome of Hagia Sophia. You can make reinforced concrete by putting metal rods inside the concrete. This makes it a lot stronger. The Romans were the first to use reinforced concrete, mainly in aqueducts. After the fall of Rome, neither the Islamic Empire nor the European kingdoms used as much concrete as the Romans had. They preferred to build in stone. But when the British inventor Besemer invented a way to make a lot of steel cheaply in the 1850s, architects realized that you could use concrete with the new steel beams to build very tall buildings cheaply – those were the first skyscrapers. Most concrete buildings today are reinforced with steel. Did you find out what you wanted to know about the history of concrete? Let us know in the comments! Cite this page: Carr, K.E. Why use concrete? History of Architecture. Quatr.us Study Guides, May 24, 2017. Web. April 21, 2019.